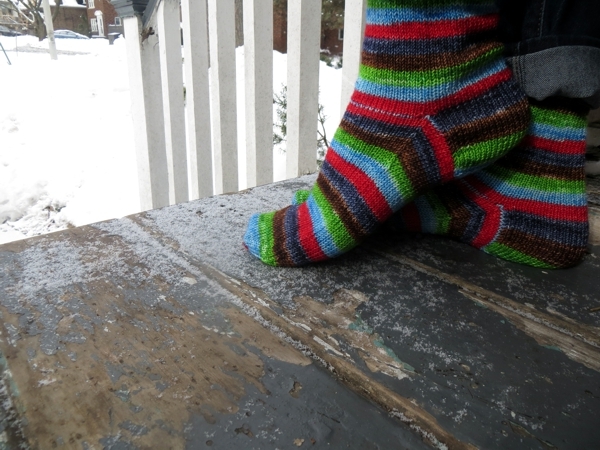 When the yarn for these socks arrived in my mailbox - it's a Vesper club colourway from Knitterly Things - I was so happy, because it was labelled Niagara on the Lake, and that is a place I love to visit. Also, the colours are fantastic. I had kind of given up on wearing jeans until last fall - I'm more of a leggings and skirt and boots kind of girl these days. But jeans do have their place and after I found a pair I quite like, the thought of wearing socks with a good denimy stripe in them was very welcome indeed. And red of course. I really, really love red! 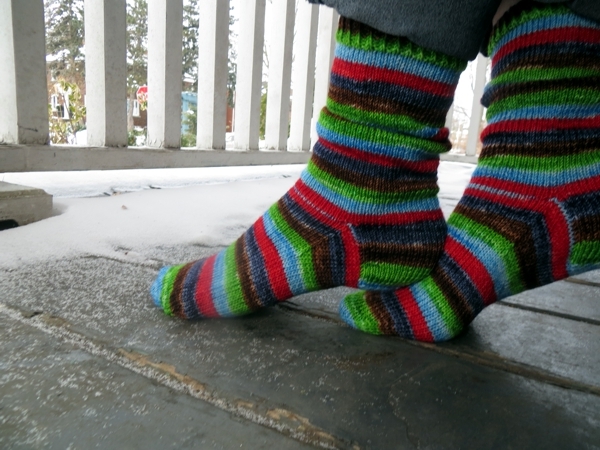 I don't wear this weight of sock very much in the winter - it's just too cold for something so light, even around the house. 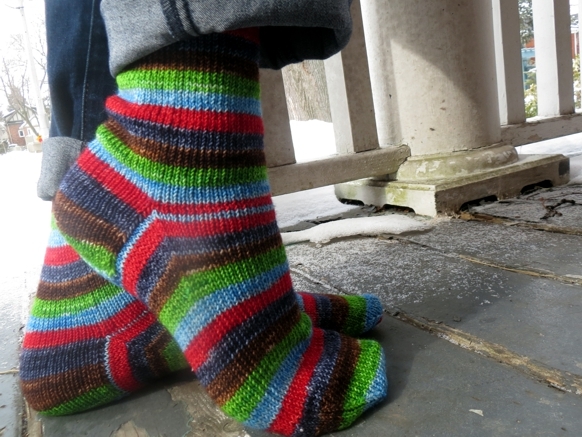 But there are still days when I'm going to be indoors a lot in a place where the heat operates effectively, and, less frequently, when the outdoor temperatures rise enough to make warm socks in warm boots complete overkill. Soon though - we live in hope - my Vesper socks will be the go-to option, and these guys are going to be at the top of the list. 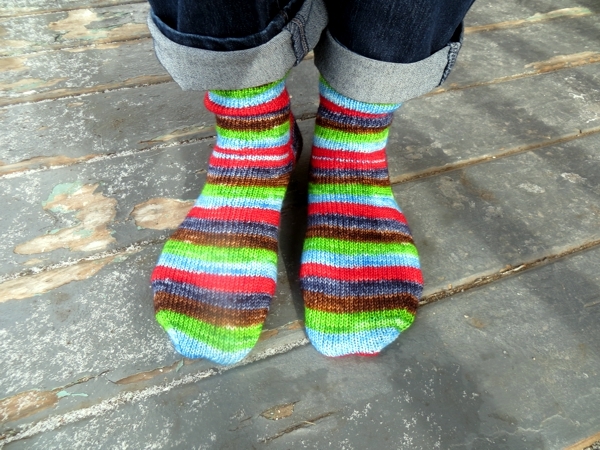 They're so unassuming, so cheerful and at the same time neutral with those brown and blue stripes. They sort of say: it's the weekend. relax! And even though I never actually relax on weekends, I want to listen. 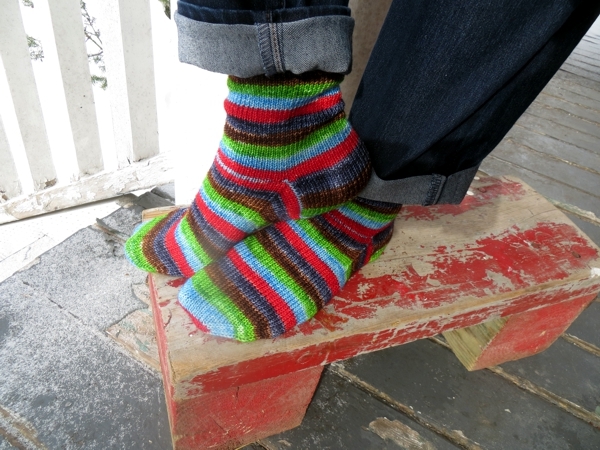 Oh handknit socks, I don't think I could ever tire of you. 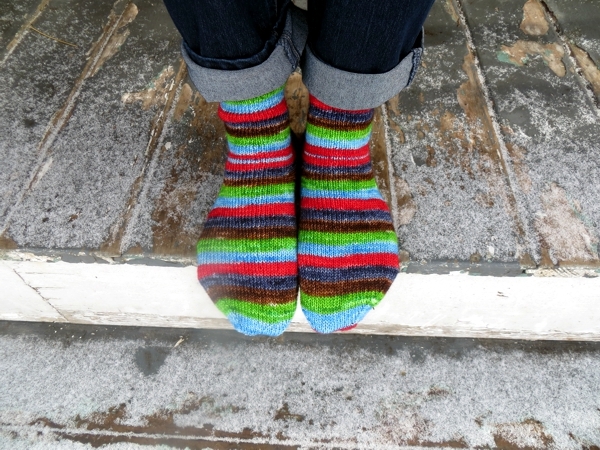 I just wish I could knit them faster! So cute! Love the color combinations, and the way the stripes work out. You can come down to our 70-plus degree weather and wear them a lot! Hey, those 19 pairs you washed the other day could come in handy for you today--2 for the hands, 2 for the ears . . .